A stripped down version of the Orion Crew Exploration Vehicle that could be ready as soon as 2013 to start carrying passengers to and from low Earth orbit, according to its maker, Bigelow Aerospace. A strippeddown version of NASA's future spaceship designed by a Nevada-based company couldbe ready as soon as 2013, according to the Bigelow Aerospace, the private companyproposing to build it. A Bigelowofficial flew to Denver in July to privately brief a White House-charted panelon the suggested design based on the planned Orion CrewExploration Vehicle, which will carry passengers to and from low Earthorbit. Such asystem is crucial to Bigelow?s plans for deploying Sundancer, an inflatable spacestation module the North Las Vegas, Nev.-based firm is building based onNASA?s Transhab design. In search of the means to transport paying passengersto Sundancer, Bigelow has spent the past two years working with Denver-basedUnited Launch Alliance to study a human-rated version of the Atlas5 rocket. But it wasnot until last month that Bigelow quietly unveiled the ?Orion Lite?concept in a private briefing to former Lockheed Martin Chief Executive NormAugustine and his White House-charted committee tasked in May with developing arange of options for an affordable and sustainable U.S. human spaceflightprogram. Bigelow?screw capsule design is modeled on the Orion vehicle that Lockheed Martin ? oneof United Launch Alliance?s corporate parents ? is developing for NASA. In a July30 interview with Space News, Mike Gold, director of Bigelow?sWashington office, said he believes a low Earth-orbit optimized version ofOrion could be ready to launch atop a human-ratedversion of the Atlas 5 within three or four years ? much sooner than NASA?sdiscredited March 2015 target for the first crewed launch of Orion and its AresI rocket. Gold saidthe Bigelow capsule would have the same outer mold line as NASA?s 16-foot (5-meter)wide Orion and possibly the same internal pressure vessel, but little else incommon. Forstarters, NASA expects the lunar-capable Orion crew capsule andpropellant-laden service module to weigh well in excess of about 40,000 pounds (20,000kg). Gold would not provide weight or cost estimates for Bigelow?s Orion Liteconcept, but said the envisioned vehicle would be light enough to launch atop anAtlas 5 with a twin-engine Centaur upper stage but no strap-on solid-rocketboosters. This configuration, known as the 402, is capable of lofting 27,557 pounds(12,500 kg) into low Earth orbit. Gold saidthe Bigelow capsule would also be capable of launching atop the Falcon 9 rocketHawthorne, Calif.-based Space Exploration Technologies (SpaceX) hopes to debutthis year. ?I don?tthink there?s any question that a commercial capsule can be constructed, testedand launched years before the existing Orion plan will come together, if itever does,? Gold said. ?We?re moving beyond Orion-Ares at this point.? A start-upventure founded in the late 1990s by real estate mogul Robert Bigelow, thecompany currently has two subscale expandablespace modules in orbit. The privately financed Genesis 1 and Genesis 2modules were launched in 2006 and 2007, respectively, from Russia aboard Dneprrockets. Acombination of rising Russian launch prices and the success of Genesis 1 andGenesis 2 compelled the company to skip the launch of additional subscaledemonstrators and accelerate development of Sundancer, a six-person space stationthat could grow to accommodate 15. ?We have ahistory of leveraging existing technology as demonstrated by the Dneprmissions, and utilizing a commercial capsule simply follows in the pragmaticpath we have begun upon,? Gold said. ?We will soon be moving forward withsolicitations focused on the airframe and getting quotes from varioussubcontractors.? Gold wouldnot say whether Orion prime contractor Lockheed Martin has or will have anyinvolvement in Orion Lite. Lockheed Martin spokeswoman Joan Underwood did notreturn multiple phone calls seeking comment by press time. But industry andgovernment sources familiar with the effort, said Lockheed has helped Bigelowwith the concept. 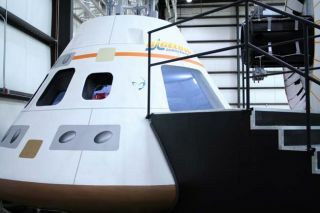 From theoutside, the full-size mockup built for Bigelow appears to be a clone of NASA?sOrion capsule adorned with the Bigelow logo. But whileNASA?s Orion is intended to carry up to six people to the International Space Stationand four to the Moon, Gold said Bigelow?s commercial variant will accommodate aminimum of seven passengers because it is intended for low Earth-orbit missionsonly. That eliminates the need for bulky propellant tanks, extremely robustheat shields and other lunar-driven requirements that add mass to NASA?s Oriondesign. ?This willbe meant for relatively short trips to and back, so there?s a difference inhang-time,? he said. ?It?s not intended to operate independently for extendedperiods, which Orion is.? One of thebiggest deviations from NASA?s Orion design involves the vehicle?s landingsystem. Whereas NASA plans call for Orion to make an Apollo-style splashdown inthe ocean, Bigelow is considering midair retrieval as a safer and moreeconomical means to land the spacecraft following atmospheric re-entry. ?Air-captureis a strategy that has been implemented many times in the past, but never doneat weights as high as a capsule,? Gold said. Midaircapture was used by the military during World War II to recover gliders andduring the 1960s to catch film canisters dropped from Corona spy satellitesorbiting overhead. Morerecently, NASA attempted a midair capture of a Genesis solar-sample returncapsule in 2004, but a parachute failure prevented the awaiting helicopter frommaking the catch. In 2007, Houston-based Spacehab, now Astrotech, dropped amockup of a space station cargo module from a helicopter and subsequentlyrecaptured it. While theBigelow capsule is in the pre-system design review stage, industry sourcesfamiliar with the effort say much of the work Lockheed Martin has done on Orioncan be readily applied to Orion Lite. Inaddition, sources said, Lockheed Martin has a number of preflight Orioncapsules planned for testing purposes that could be turned into flight vehiclesfor Bigelow. Bigelow isnot the only private space company venturing into the realm of mannedspaceflight: SpaceX plans to fit at least seven crewmembers aboard its Dragoncargo and crew capsule designed for trips to and from the space station. Gold saidBigelow wants to see SpaceX succeed with Falcon 9 and Dragon. ?However,we would be foolish to depend completely on one capsule provider or any singlelaunch system,? Gold said. ?Therefore, it?s vital from both a practical andbusiness perspective to ensure that SpaceX and Dragon aren?t the only optionsavailable to us, hence the need for another capsule. ?